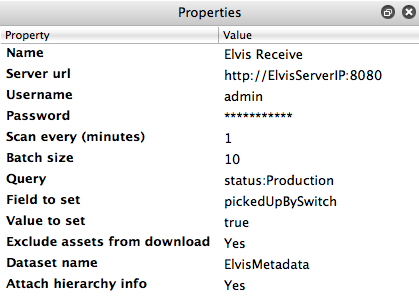 To integrate Elvis Server into Enfocus Full-/PowerSwitch, we have created Elvis Send and Elvis Receive configurators. These configurators are available by default in Full-/PowerSwitch 09. For Full-/PowerSwitch 10 & 11 they are available on the Switch partner integrations Web site. In combination with configurators from other vendors, it's possible to extend your workflow with Elvis, or extend Elvis with your workflow. This configurator allows you to query your server and it will return the assets from the query results. These assets are downloaded as a copy straight from the Elvis server. The configurator uses SOAP calls with a search query to find the requested assets along with their metadata. It is able to set a metadata field to prevent repeated download. This configurator can be used in combination with the Elvis Send configurator. This can be configured to import assets to a designated location, while setting a metadata field value, or it can be used in combination with an Elvis Receive configuration to create a variation of an existing asset, update an asset or set metadata for an asset. You can create or update an asset in Elvis. For a create action, set the Folder property. Update the asset if it already exists in Elvis at the specified Folder and with the same filename. If it doesn't exist, create the asset at that location. The Folder property must be set. You can create a variation on an existing asset with a relation to the original. The incoming job must originate from an Elvis Receive configurator. To update metadata on an existing asset, the Field and Value properties must be set. 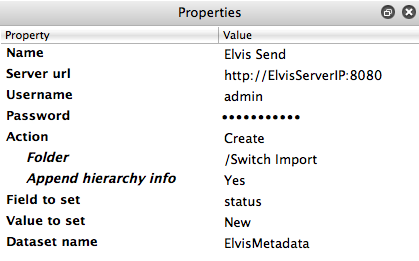 The incoming job must originate from an Elvis Receive configurator.